The steep hills make this short run near Portland, Oregon into something like a “fartlek” where the changes in terrain offer this runner challenging conditions. I have found this to be excellent cross training as a cardio workout to support my general fitness goals and so I’m in shape for kickboxing. If you’re new to trail running you can also make this into a hike or by jogging sections as you catch your breath just to get a start on fitness. I’ve also thought of strapping on my backpack and using these hills as conditioning for multi-backpacking and wilderness hiking. In light of Portland’s rugged Northwest lifestyle it seems like it’s time to share some exciting fitness and nature opportunities around our great city. Perhaps you’re getting ready to run in the Portland, Oregon Shamrock Run. This challenging 3.2 mile loop climbs (and descends) over 940 vertical feet. 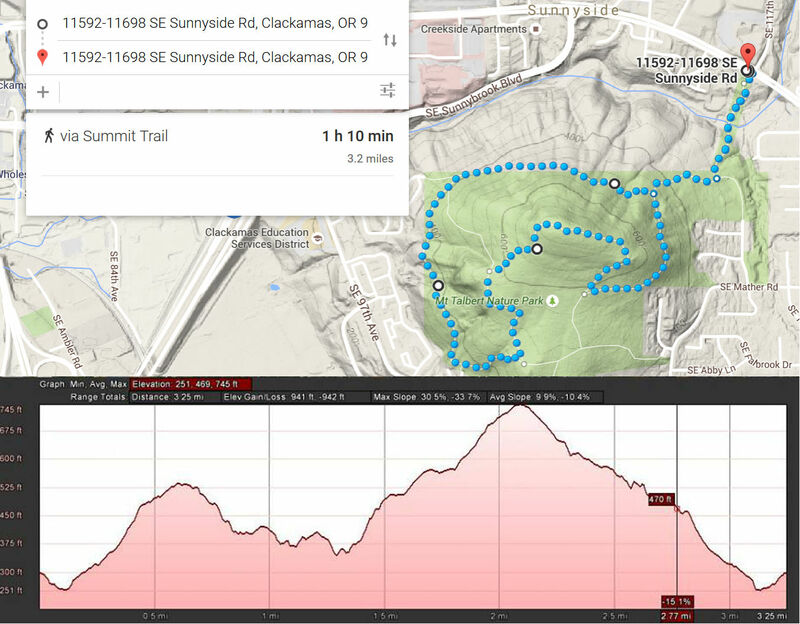 The trail run features steep elevation and great scenery so make sure to try this route as part of your routine. As a time/distance reference, I can normally run a standard 5k race in around 21-22 minutes depending on how well rested I am and how many carbs I’ve eaten. However, this high/steep elevation profile has me feeling accomplished if I can complete this route in under 30 minutes (for this route my best time is 29:17, done in late summer, 2016). For the video posted, my total elapsed time was a more modest time just under 33 minutes. 0.0 miles: Take Sunnyside Access Trail. 0.2 miles: Keep Right at Fork. 0.4 miles: Turn right on Park Trail Loop. 0.9 miles: Go left & stay on Loop Trail. 1.0 miles: Go right & stay on Loop Trail. 1.3 miles: Turn left & stay on Loop Trail. 1.5 miles: Turn left onto W. Ridge Trail. 1.9 miles: Turn right onto Summit Trail. 2.4 miles: Turn left back onto Loop Trail. 2.8 miles: turn right to Sunnyside Trail. 3.0 miles: Keep left toward Sunnyside. 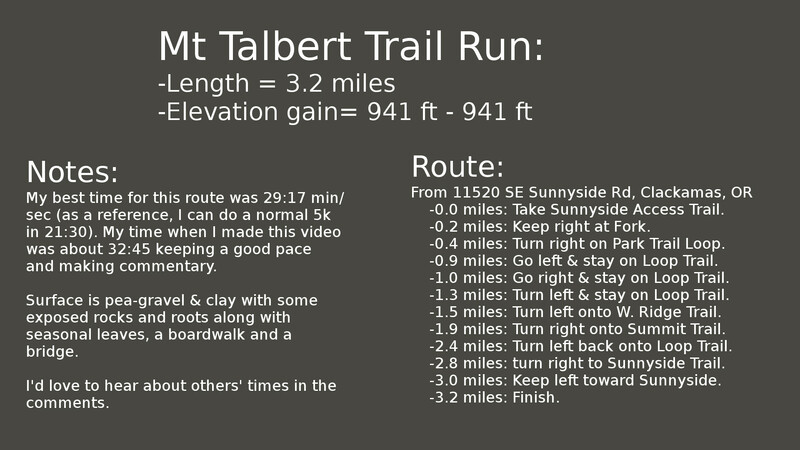 The network of trails around the Mount Talbert Nature Park gives plenty of outdoor opportunities. Keep your eyes out for large gray squirrels that make their homes among the mature oak trees. There are a number of different trail options in this park but be aware that the elevation change will be a big factor in your running elapsed times.